A man sat in an up-scale restaurant behind a table dressed in linen and the finest tableware. He ordered an exceptional wine from an extensive list and a la carte from a carefully crafted menu. The kitchen was staffed by a world-reknown chef and his team. When the wine came the man criticized its’ bouquet. When the food came he nit-picked each course, all the while fussing about the service. Among the casualties of our materialistic culture are joy and gratitude. These are predictable consequences when we devote ourselves to aquisition and the preening of our appetites. Our expectations run away with themselves. Look around you. Even if you live in a somewhat diminished scale, chances are your home is filled with more than you need. Under such circumstances you would think that your joy and gratitude would be epidemic, contagious. Are they? Feeding the unrequited appetites of the self and living with a profound sense of gratitude tend to be mutually exclusive. There is nothing complicated about this. 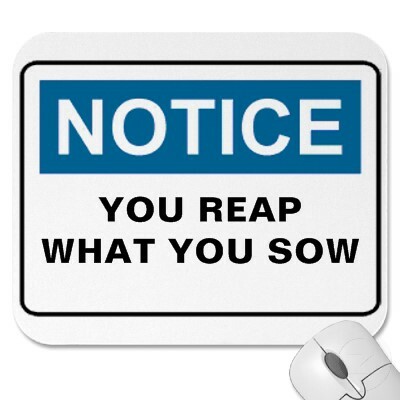 If you sow unto yourself and your wants, you will reap the weeds of ingratitude and insatiable desire. if you invest the day with the currency of gratitude, even the smallest thing can provide the occasion to praise God joyfully. I reblogged this because it is a great illustration of what I have been “seeing” a lot lately. Though I am very soon to be unemployed, I would rather be grateful for what I have than have more and be bitter and resentful all the time! I feel the same way, Ann Louise. It’s tough, though. I need to be reminded, and often, of what I really have, what is important and lasting and what is not. Hoping and praying for you that you won’t be out of work very long. Glad you reposted this one. I think all of us need a reminder now and then.